This past week I’ve focused on getting the building builder up and running, and improving the new system for creating the hole. So, let’s get to the meaty details! 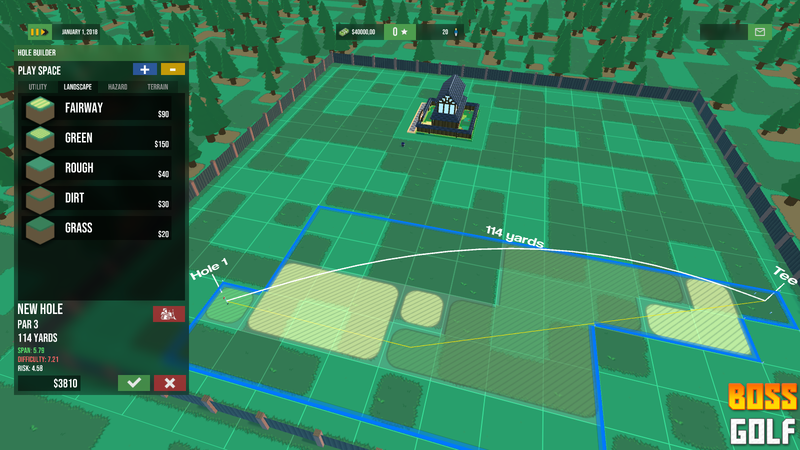 In Boss Golf, buildings will be instrumental in expanding your resort, improving its rating, and giving you access to new features. To build something up, You start by drawing up the plot (the blue/yellow buttons at the top). This will form the basic blueprint for your building, determining its shape. The bigger the building, the better the bonuses. 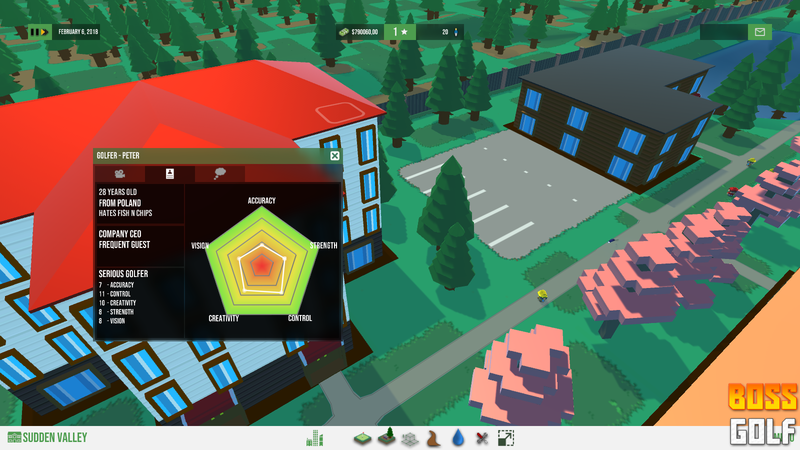 Then you can choose the building type, which will modify the options available to you. Building a pool? You’ll have the option to add the pool, a poolhouse etc. Building a restaurant? Perhaps some outdoor area would be nice! 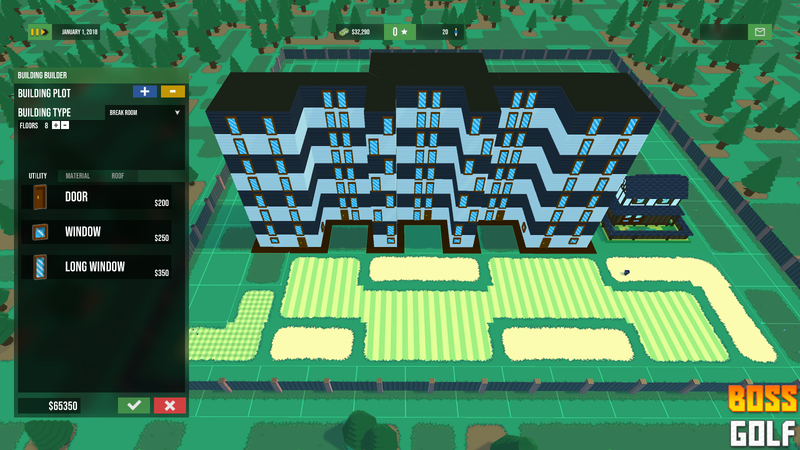 Oh and you can also set the number of floors you wish for your building! Finally, you’ll paint the walls with the material you wish, and choose the style of roofing for the top. Once you approve of the construction, the building will be set for uh construction, and the little builder guy (if you have any hired), will approach it and get to work! You’ll see a scaffolding popping up surrounding the building as the work is done. The size of the building will determine how long it’ll take to be completed. I’ve made some decisions regarding the building of a hole. 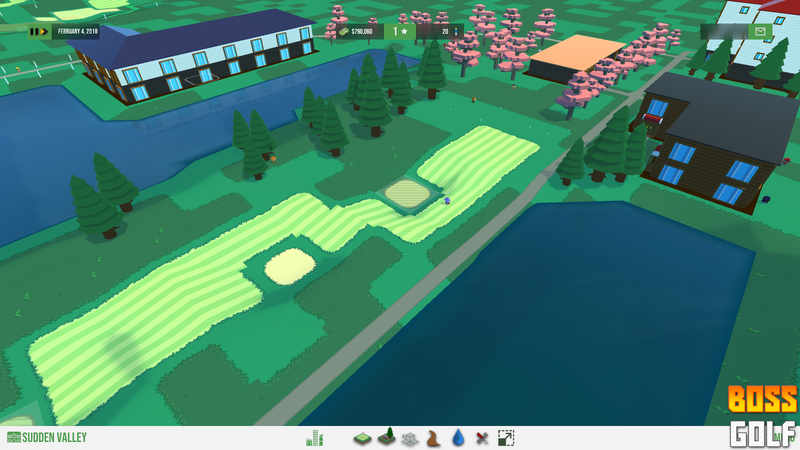 To start off, you’ll be able to set the hole/tee positions, landscaping with the tiles, adding hazard (bunker, water etc), and modify the terrain. Decorations will only be available outside the hole play area. Now, outside the hole builder you’ll still be able to place landscaping tiles. But you won’t be allowed to place fairway and green tiles outside the hole builder. If you want to edit the hole, you’ll have to open the editor. It loses some of the previous flexibility, but the control gained makes it worth it. This is basically a measure of the size of the playing area on the course. It’s a relationship between the yardage of the hole, and the number of tiles it uses. So a long course with a lot of tiles will have a higher Span measure than a long course with fewer tiles. It is a very simple dimension. This measures the relation between the number of good tiles and the number of hazard tiles on your course. If there’s more good tiles, it’s an “easier” course; if there’s more hazard tiles, it’s a “harder” course. At first glance, this is a very simple way of measuring difficulty. It could be that your hole is set in a single green tile surrounded by water, and every other tile is a nice well kept fairway. It would really unbalance the rating of the course and make it look deceptively easy. That’s why we have the next rating. Risk will basically look at the hole and find particularly difficult shots. It checks the connections between each tile to assign them a rating, thereby identifying tricky spots. It act as a counterbalance to the Difficulty setting. So where the hole described above would have “low difficulty”, the risk factor would be through the roof. It would be a hole that would consist of a single challenge, with an easy path until you get to it. Increasing the Risk of your being thrown off your game by a tricky hole. So with those three guides, you can more accurately measure the kind of hole you are building, and how to make it better. Golfers will have their preferences in those three aspects, making it a challenge to keep your members happy. 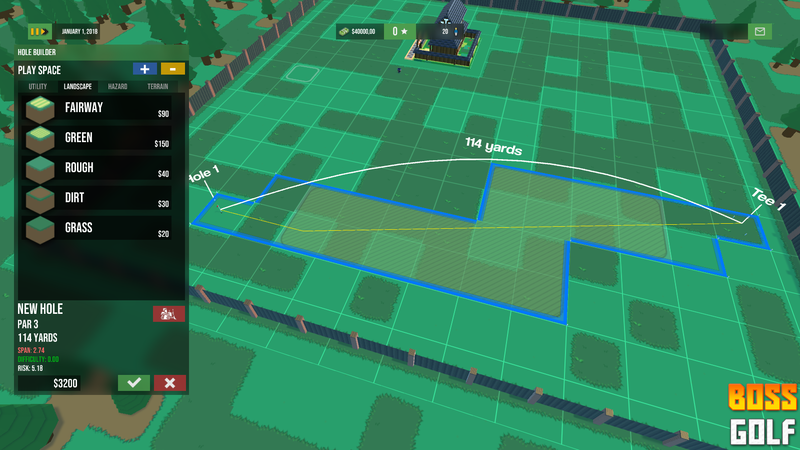 Later, way later, I’m also planning on allowing you to save the hole you’ve built so that you can use as a preset at another course. Take your classic number 9 with you. That’s about it for now. The builder guy is also in, to begin building the stuff (though there’s of course bugs with it). That’s all for now! Stay tuned for next week’s update! Following the development path, this week has been focused on extending the new UI to the other elements, implementing the localization pipeline, and beginning the implementation of new workers! To start off, the new UI! In there you can see one of the new features, which is the resort rating. It’s based on the categories as seen in the window. 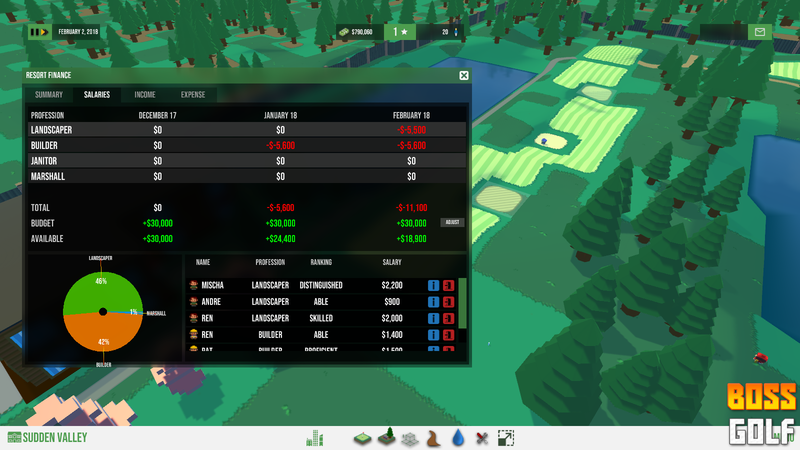 Improving these will increase the rating of your resort, which will unlock new things as well as attract better golfers. These are for when you wanna expand your resort! You can now break new ground and expand your resort to accommodate more holes. Now, the number of holes you can build is limited to the size of your resort. Need the full 18 holes? Gotta need a larger resort! Next is the localization pipeline. 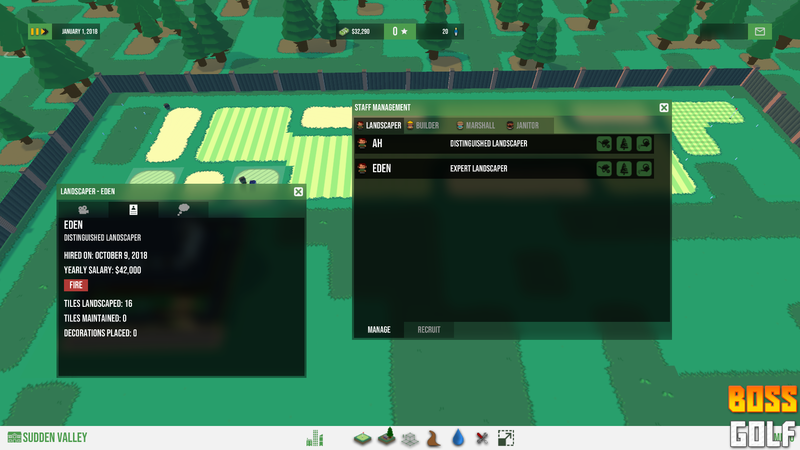 It has been integrated into the panels, and anything that uses text in the game will be connected to a main localization controller that pulls the necessary data. It’s also very easy to update/add new languages! Big win! And I’ve also begun adding new staff to the resort. Soon there’ll be janitors and foremans roaming around. I’m also implementing the systems ingame to make those characters needed! That’s all for this week! These updates will tend to come on the weekend, as that’s when I have extra time to boost development!